Ardella Diggs, a sixth-grade science teacher at Pattonville Heights Middle School, was selected to receive a classroom makeover sponsored by Because of Them We Can™ and American Family Insurance. Both organizations celebrate educators and students year-round and sponsored the back-to-school sweepstakes makeover. Diggs was selected out of 600 entries to receive a prize of $2,500 for the classroom makeover; Because of Them We Can soft-cover books, posters and backpacks; 100 lunch bags for her students; and a variety of school supplies. 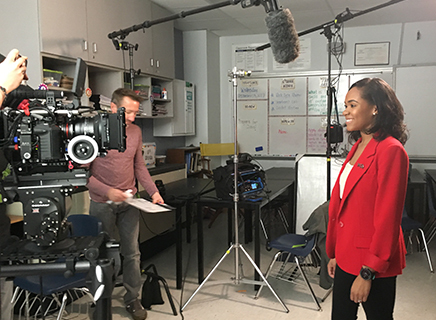 As part of the recognition, the sweepstakes sponsors are producing a video featuring an interview with Diggs and footage of her teaching in the classroom. Ardella Diggs is shown being interviewed on camera for a video about her classroom makeover.